Phil Cox, 8, holds a bunny at the Capital Area Humane Society event Make Mine Chocolate. 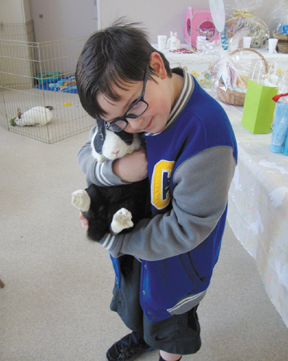 The event aimed to educate residents about bunny rescue, adoption and education. Many parents may think that a four legged friend with floppy ears would make a great addition to their child’s Easter basket. However, a local animal shelter, along with a variety of rescue organizations are asking parents to think again. 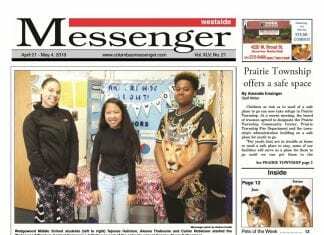 On March 22, the Capital Area Humane Society partnered with the Columbus House Rabbit Society to host the event, Make Mine Chocolate. According to Cook, rabbits are the third most surrendered pet to the animal shelters and rescue groups. People buy rabbits thinking they are cute and little, but do not think about the responsibilities of owning them long term. Another common misconception is that rabbits should be kept in confined cages, when they actually should be around family members and other pets. They thrive with social interaction. According to Cook, rabbits need mental stimulation and should live indoors. The Columbus House Rabbit Society recommends that rabbits live in a four-by-four pen that is three feet tall and is inside the home. They also recommend pet parents include a litter box in the pen, a box where they can hide and toys for them to play with. However, the Columbus House Rabbit Society also stated that there are many benefits to owning a rabbit and in no way wants to discourage people from adopting one. For more information on rabbit adoption, contact the Capital Area Humane Society at 777-7387 or the Columbus House Rabbit Society at 470-0093.